"Shrek Forever After" has billed itself as the last in the green ogre's saga, and if that's really the case, at least he went out having regained at least a measure of his old luster. The latest installment finds Shrek in a "Groundhog Day"-like cycle of tedium, repeatedly reliving an onslaught of play dates, clogged drains and nosy tourists. Like so many pop culture father figures, he finds he's no longer the ogre he once was and longs for a time when his days were spent simply terrorizing villagers. As is the customs in fairy tales, a mischievous "curly-toed, redheaded weirdo" appears, eager to make that dream come true. Rumpelstiltskin offers Shrek a contract granting him one carefree day in exchange for one day from his past. As you would imagine, there's a catch and Shrek has only 24 hours to set things straight before they go irrevocably sideways. Mike Myers, Cameron Diaz and Eddie Murphy are fine, if a wee bit stale, but Walter Dohrn brings an energy and joe to Rumpelstiltskin that goes a long way towards keeping the film moving. High five to whomever had the good sense to cast Dohrn after hearing his reading of the part in the writer's room. 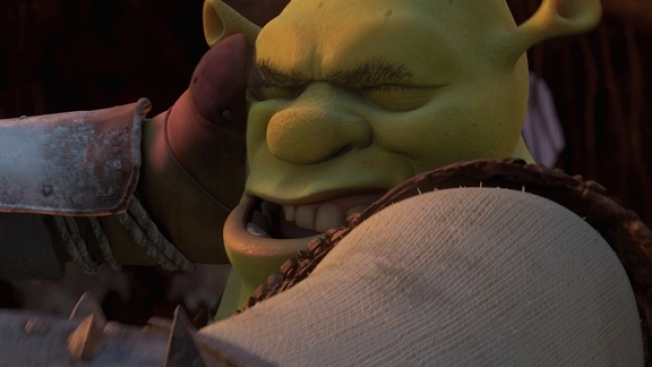 PopcornBiz caught up with some of the stars of "Shrek: Forever After" to chat about what it means to have the animated flick opening the festival. And Craig Robinson once again distinguishes himself in a minor role as the chef of an ogre encampment. Time and again Robinson manages to get every ounce of funny out of every line he's given. This final chapter, like the ones before it, offers up plenty of pop culture winks and nods, but not at the exhausting rate of some of its predecessors, and they're broad enough that your kid won't be bugging you to explain them. Better yet, they've taken the peddle off the gas on the song 'n dance numbers. Yeah, they're still there, but there not nearly as gratingly show-stopping. That said, a short Beastie Boys sample that sets some witches to dancing works nicely. There are, however, a couple of original songs laid over the action that do nothing to make things better, they're just an annoying distraction. And whatever street cred may have been clinging to should be revoked for recording a cover of "I'm a Believer" for the film -- is there any thing less cool than covering a Smash Mouth cover of an Eddie Murphy cover of a Neil Diamond cover of a Monkees recording of a Neil DIamond song? Other than getting bumped from the "Shrek 2" soundtrack by the Counting Crows, that is. "Shrek Forever After" is a good, not great, wrap to the franchise that should be reasonably painless -- it clocks in at a brisk 93 minutes -- for parents who get dragged along by their kids. Whether your kids will like it is another question.